Whilst browsing through some early copies of ‘Transactions of the Devonshire Association’ I came across a paper written in 1876 by J. B. Davidson. It was called ‘Some Anglo-Saxon Boundaries, Now Deposited at the Albert Museum, Exeter‘ and contains details of the Peadington Landscore. According to Davidson this charter consisted of; ‘a strip of parchment, about 13 inches long by 3¾ inches wide, inscribed in clear and good Anglo-Saxon characters, (1876, p.397). The Peadington Landscore Charter described the various boundary points which delineated an early Saxon estate which has been said to belong to an ecclesiastical establishment, more of which later. The general consensus of opinion is that this particular manuscript was a copy and that the original would have dated back to the early eleventh century. Therefore there is a strong possibility that some of words may have been subjected to misspelling during the copying process. Much of this estate was located around southern Dartmoor, hence its inclusion on this website. For now it will be useful to examine the document line by line – full details can be found opposite. Davidson (p.404) estimated that the land encompassed within the Peadington bounds to be about ten miles running from north to south by around six miles in a east to west direction. There are three key Anglo Saxon word here that give the location of the first boundary point; landscaro, aescburne and utscyt(e). The first translates as boundary, the third as outfall/outlet (Clark Hall, 2004, p. 211 & 391) and the second is the old name for the Ashburn watercourse that runs through Ashburton. Therefore we have roughly ‘Peadington’s boundary at the point of the Ashburn’s outfall’ (in fact it joins the River Dart). The key words here are dertan and wedeburne, both old Saxon river names, dertan, refers to the River Dart and wedeburne to the River Webburn, both of which first appear in the 10th century Cartularium Saxonicum, (Gover et al. 1992, p.4). So this gives us the point where the River Webburn ‘outfalls’ into the River Dart just where the modern Buckland Bridge is located. At this point the charter translates as following the Webburn upstream to widemor and presents a problem; which River Webburn? Today there are two Webburn rivers, the East Webburn and the West Webburn. Davidson proposed that the name referred to the West Webburn, (p.399) a fact that Dave Brewer agreed with, (2002, p.302). He reasons that from at least 1526 the East Webburn has been referred to as the Neperell or Niprell and Hemery writes that from the 10th century the West Webburn has been documented as Wedeburn (1983, p.100), so let’s assume they are both correct and the boundary follows the West Webburn. Next problem, where was widemor? Brewer suggests that if the Saxon letter for ‘th’ thus giving withimor is replaced by a ‘d’ then it mutates to become widemor (p.302) as in the Landscore. The first documented name for Widecombe was Widecumb that appeared in the Charter Rolls of 1270, the first element of the name derives from the Saxon word is wiđig and the second is cumb which basically translates to ‘wide’ or ‘withy (willow) – valley’, (Gover et al. 1998, p 526). Be it ‘wide’ or ‘willow’ the boundary ran from what is known today as Lizwell Meet then followed the West Webburn up to Widecombe. Here there are three words to consider; cealfa, dune and middewearde, and now we have a divergence of opinion, Brewer (p.302) is of the opinion that the word translates as ‘cold’. Whereas Davidson (p. 399) opts for ‘calf’, a fact also born out by Clark Hall (p.65) so let’s go with that. The second word dune is fairly straightforward if you come from Newcastle, ‘simply a down/moor’, (Clark Hall, p.900). Finally Clark Hall translates the word middweard as middle or through the midst, (p.236) which is close enough to what appears in the Landscore. So we then get ‘from Widemore to the middle or midst of Calf Down’ which most writers associate with the mighty ridge of Hameldon. This part is simple, the two words that give us an indication of the next boundary point are sufon and stanas the first of which translates as seven, (Clark Hall p.325) and stanas meaning stones, (Clark Hall p.318). The Anglo Saxons often referred to stone circles or ring cairns as ‘Seven Stones’ regardless of the number of stones making up the circle. This then reads as ‘from the Calf Down to the Seven Stones’. The seven stones are a small Bronze Age ring cairn known variously as The Seven Stones, Ring of Stones and Ringastan. The use of such prehistoric monuments as Anglo Saxon boundary markers was not unusual, as Hooke, (1998, p.98) indicates; ‘In their boundary clauses the Anglo-Saxons frequently referred to features of an earlier period and were obviously familiar with their use‘. Now there are two words to conjure with, hyfan and treow, the latter translates as ‘tree’ (Clark Hall p.348) but there are two possibilities as to the former. Clearly whatever tree was used is no longer in existence so it is hard to establish what it was, one option is that the word hyfan mutated from a personal name such as huf or hyfa thus giving the ‘Tree of Hyfan’, (Glover et al. p.248). This suggestion has also offered for Heatree Down and Farm which are also on Dartmoor. But maybe the other offering could be a virtual literal translation from the word hyf meaning ‘hive’, (Clark Hall, p.209) which would give the ‘(Bee) Hive Tree’ or the tree with a (bee) hive’? Either way it’s not around today and hard to locate, however Brewer was brave enough to suggest that from the ‘Seven Stones’ the boundary picked up an old Bronze Age reave that runs down the left bank of the Wallabrook to a broken gatepost which is at the junction of the later day bounds of Widecombe, Lydford and Manaton parishes which could have been where today the wall runs down to the West Webburn on the northern edge of Soussons Plantation. This is my favourite part, it conjures up Indiana Jones pictures and the two important words are hord and burh. hord simply translates as ‘treasure’, (Clark Hall p.190) and burh which has mutated from beorg which means ‘mound’, (Clark Hall p.42), thus giving the ‘Treasure Mound’. When appearing in place-names the word beorg is used to describe a prehistoric barrow and often refers to the belief that such burial sites contained treasure, they were sometimes chosen as markers for outdoor meeting places such as the Seven Lord’s Lands cairn. In modern archaeological terms the word ‘barrow’ has in fact mutated over time from the word beorg with its roots firmly seated in the West Country, (Gelling, 2000, p.132). So where was the ‘Treasure Mound’? Virtually all sources state it is the large tumulus just to the south of King Tor known as King’s Barrow. From the ‘Treasure Barrow’ the boundary runs on to the deorford which translates exactly as it sounds – the ‘Deer Ford’ coming from deor (Clark Hall p.84) and forda (Clark Hall, p.125). The route taken is from the barrow to possibly the head of Smallacombe Water and down to where this runs into a feeder of the River Bovey somewhere around Vogwell, (Brewer, p.304). Having reached the ‘Deer Ford’ the boundary moved on to langestan which translates as the ‘Long Stone’, coming from lange – long, (Clark Hall p.211), and stan – stone/rock (Clark Hall, p.319). The longstone or menhir is no longer in-situ but this boundary marker is thought to have stood near the farm of Langstone which took its name from the menhir or the nearby crossroads of Langstone Cross. From the ‘Long Stone’ the boundary now runs down to eofede tor, the Saxon word ifig means ‘ivy (Clark Hall p.203) and torr is as expected; ‘tower/rock, (Clark Hall p.346). Then we end up at ‘Ivy Tor’ of which the exact location has been lost in the mists of time but Brewer (p.304-5) considers it may have been an outcrop on Greator Farm. This assumption comes from the fact that on the farm there two fields named Higher and Lower Ivy Tor. Ransom (205 p.8) takes a different view and places ‘Ivy Tor’ at Manaton Rocks which seems slightly odd as the rocks are only a very short distance from the previous boundary point of Longstone. However, in The Place Names of Devon the following appears under the listing of Haytor; ‘The modern form is corrupt and must have been influenced by the spellings of Haytor Hundred. Nothing can be done with the forms as they stand and the etymology is not made easier if we take the eofede tor of BCS 1323 (Cartularium Saxonicum) to refer to this tor‘. (Gover et al. 1998, p.476). So here they are actually referring to Haytor as the eofede tor minus one letter ‘f’, could this be ‘Ivy tor’? There is also another possibility, the Saxon word hefig translates as ‘important/oppressive and in pronunciation sounds similar to Eofede a term that could easily be applied to Haytor as it sits in the landscape? But for now it will be accepted that ‘Ivy Tor’ was located near Greator Farm. Having left ‘Ivy Tor’ the line moves across to hean dune forwearde this being forwearde, (Clark Hall p.128) as ‘in front’, hean as in heanes meaning ‘high’, (Clark Hall p.174) and dun being down. There we now have ‘to the front of High Down’ which most likely was the high part of Black Hill. Incidentally there are some prehistoric cairn at this point which would be in keeping with the same theory as the sufon stanas above. Now the line moves from the ‘High Down’ to the blindan wille from where we get blindan which comes from blind which literally means blind (Clark Hall p.52) and wille/welle ‘spring’. So we now have the ‘Blind Well’, Davidson (p.401) interprets blind as representing a ‘dry well/spring’ but conversely Hooke, (p.18) suggests it may suggest an ‘hidden or secret well/spring’ which would be in keeping with blind as it’s unseen. To complete the team effort Brewer (p.305) considers this could be the modern-day Yarner Wells. The next stage of the journey runs from the ‘hidden Well’ to the writelan stan, we already know that stan means ‘stone’ and according to Clark Hall (p.422) writelan translates as to ‘cut/draw a figure’ which ties in nicely with Brewers (p.305) idea that it meant inscribed, so this gives us the ‘Inscribed Stone’. As to what the stone was inscribed with is anyone’s guess and one thing this part of Dartmoor is not short of is inscribed boundstones. 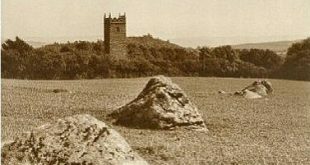 Brewer gives two possibilities; the ‘Three Parish Stone’ or a stone called the ‘Old William’, (p.306), Davidson puts the stone as being the ‘Bishop Stone’ at Lustleigh (p.402). Ransom places it near Hole Rock, Mike Brown (1998, p.12) agrees with Davidson and everyone has there own idea, here we go with the Three Parish Stone. From the stone (wherever one it was) the boundary travels on to ruwa beorh, this derives from rüh leading to ‘rough’ and beorh as seen above giving barrow, thus ‘Rough Barrow’. One may assume that this is another instance of Saxon boundaries using prehistoric features as markers but according to Phil Newman of English Heritage this so-called barrow never was such and was merely a natural feature (on-line source – HERE). Either way today it is called Owlacombe Barrow, (Brewer, p.306) and the spot is now marked with a boundstone erected by the Duke of Somerset in 1853. From the ‘Rough Barrow’ the Landscore boundary runs down to Green Lane and then picks up Tipley Hill Lane and eventually arrives at fyrspenn. Here we have the element fyrs meaning furze/gorse (Clark Hall p.145) and penn giving literally a pen or fold (Clark Hall p.272) thus ending up with the ‘Furze/Gorse Pen/Fold’ which today although thickly wooded is Penn Wood. The final leg of the Dartmoor Peadington bounds now runs from the ‘Furze Fold’ to wyrt cumes headod which translates to wyrt meaning ‘herb’ (Clark Hall p. 428) and cumb for ‘combe/valley’ (Clark Hall p.76) plus headod as seen above for head which produces ‘Head of the Herb Valley’. There is a small combe just south of Rora House in which a small feeder stream runs into the Liverton Brook which lies neatly between the ‘Furze Fold and the next boundary point of rammeshorn. This name needs little explanation as it is simply the ‘Rams Horn’ and is marked on the modern map as Ramshorn Down. Incidentally the names comes from the fact that when viewed from other prominent heights the curving hill takes on the shape of a rams horn, (Glover et al, 1998 p.466). From Ramshorn Down the boundary drops down to luca stile which takes it outside of the modern National Park Boundary and as far as this website is concerned that is where of life stops. If you are interested in following the rest of the Peadington Landscore then it can be found in Davidson’s paper. Once it has completed it’s round the houses trip off Dartmoor it completes the circuit by joining back to where the Ashburn joins the River Dart. Having looked at the bounds of the Peadington Landscore the next question is who owned the lands? There are two main contenders; the monastery at Crediton and the Bishops of Exeter estate in Paignton. The consensus appears to be that of Paignton which at different times and various spellings has been Peingtone meaning ‘Pæga’s Farm’. It is not hard to imagine how Peingtone can mutate into Peadington especially when some local dialect is thrown in for good measure. But why would this estate need land upon Dartmoor? Recent published work by Harold Fox has identified various links between lowland manors and estates and upland Dartmoor for the purpose of summer grazing for their livestock. Hooke (p.192) states; ‘Undoubtedly the moorland provided summer pasture for the lowland manors just as it does for the farmers around the moor today‘. Even today it can be seen that much of the land ring-fenced by the Peadington bounds provides excellent grazing grounds as a visit to the Hameldon, Haytor, and Ripon Tor areas will testify. It is also interesting to see that many of today’s parish boundaries still follow parts of those set down in the Peadington Landscore (as can be seen from the map above). This fact is reiterated by many authors and as just one example Brewer (p.302) says; ‘It is generally found that old boundaries never disappear, but are amalgamated into later ones‘. For those who enjoy distance walks with a difference a perambulation around the Peadington boundary would make for an excellent route. With a few exceptions in the south and to the north much of the suggested boundary can be followed with public access either across moorland or along lanes, I have estimated that the total length of the route would be around twenty eight miles and would take the walker through a whole gamut of moorland landscapes ranging from river valleys to high moorland. Brown, M. 1998. Dartmoor Field Guides – Vol. 44, Plymouth: The Dartmoor Press. J. B. Davidson 1876 Some Anglo-Saxon Boundaries… Transactions of the Devonshire Association – Vol. VIII. Gelling, M. 2000. Signposts to the Past, Chichester: Philimore & Co. Ltd.
Gover, J. E. B., Mawer, A. and Stenton, F. M. 1992. The Place-Names of Devon – Vol. 1. Nottingham: The English Place-Name Society. Gover, J. E. B., Mawer, A. and Stenton, F. M. 1998. The Place-Names of Devon – Vol. 2. Nottingham: The English Place-Name Society. Hemery, E. 1983 High Dartmoor, London: Robert Hale Ltd.
Hooke, D. 1998. The Landscape of Anglo-Saxon England, London: Leicester University Press. Ransom, B. 2005. A History of Islington, Chichester: Philimore & Co. Ltd.